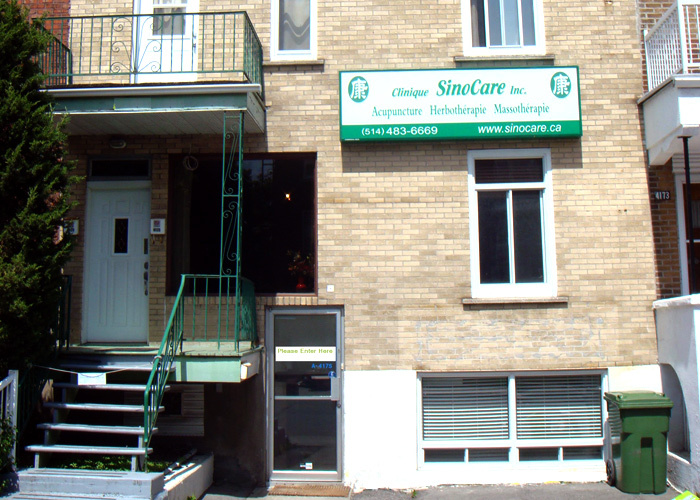 Sinocare is conveniently located close to all six infertility clinics in Montreal. In addition, Sinocare is only 100m south of Villa-Maria Metro Station and is near exit Cote St-Luc (exit 65 northbound) and Sherbrooke (exit 64 southbound) of Highway 15. Free parking is relatively easy to find around the clinic, because this section of Decarie Blvd is a semi-commercial street. 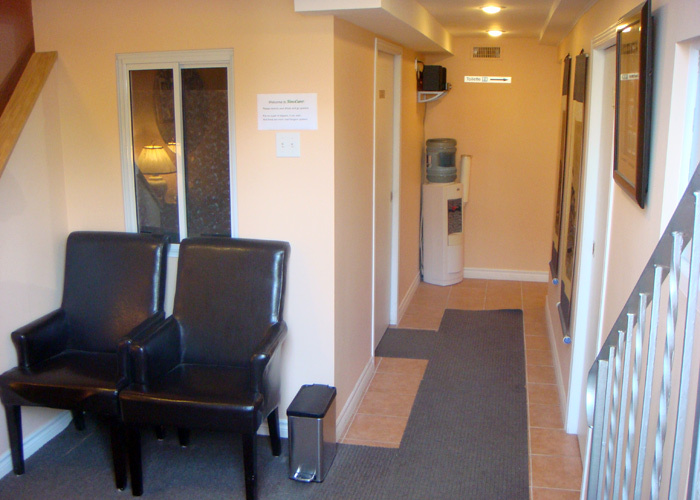 4177 Decarie Blvd., Montreal, QC Canada H4A 3J8 Sinocare is conveniently located close to all six infertility clinics in Montreal. See Map for details. In addition, Sinocare is only 100m south of Villa-Maria Metro Station and is near exit Cote St-Luc (exit 65 northbound) and Sherbrooke (exit 64 southbound) of Highway 15. Free parking is relatively easy to find around the clinic, because this section of Decarie Blvd is a semi-commercial street. Home, hospital, or fertility clinic on-site treatment is available with reservation and surcharge, see Fees for more details. A master’s degree in gynecology. 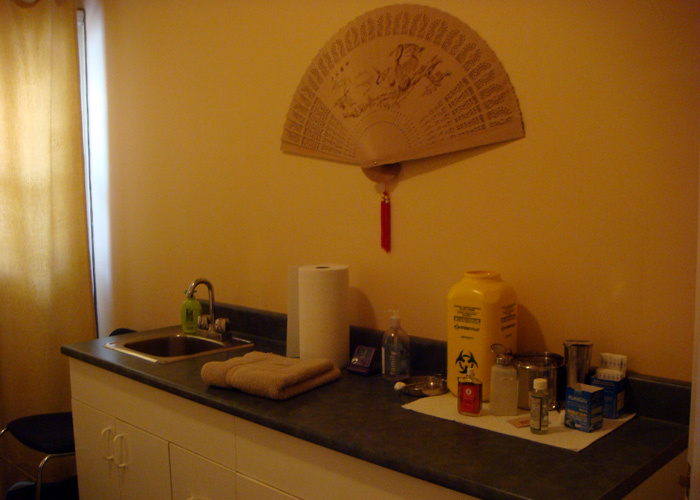 She is the only acupuncturist in Quebec who has this degree. 5 years of medical doctor’s degree and 2 years of master’s degree at the Guangzhou University of Traditional Chinese Medicine. 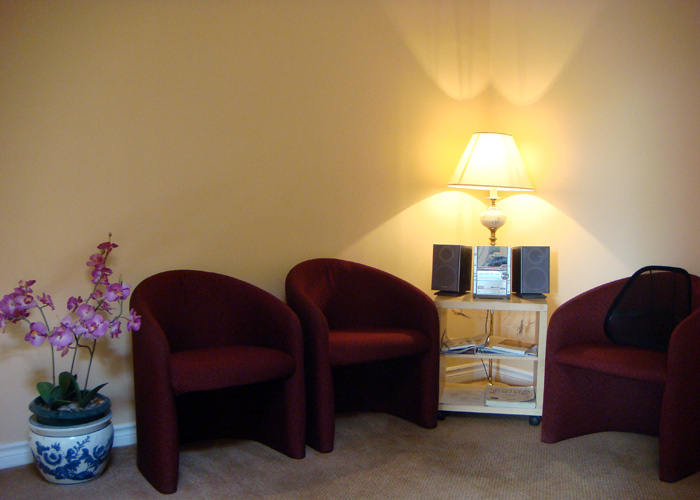 Treating infertility and gynecology patients full-time since 2005. 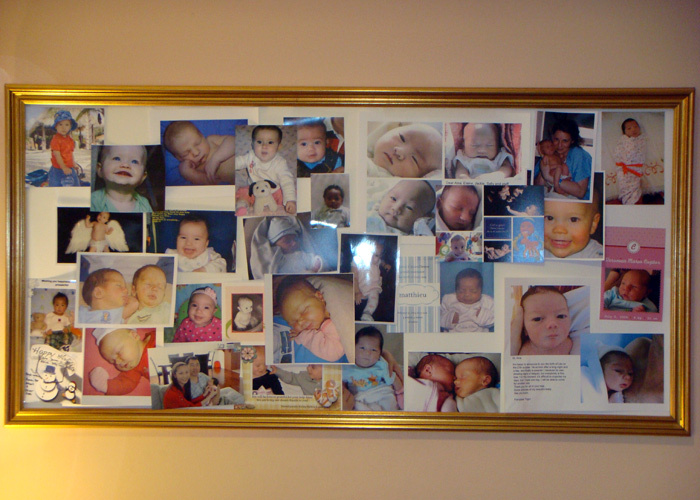 Helping make over 1000 babies, including those of Celine Dion and Julie Snyder in recent years. 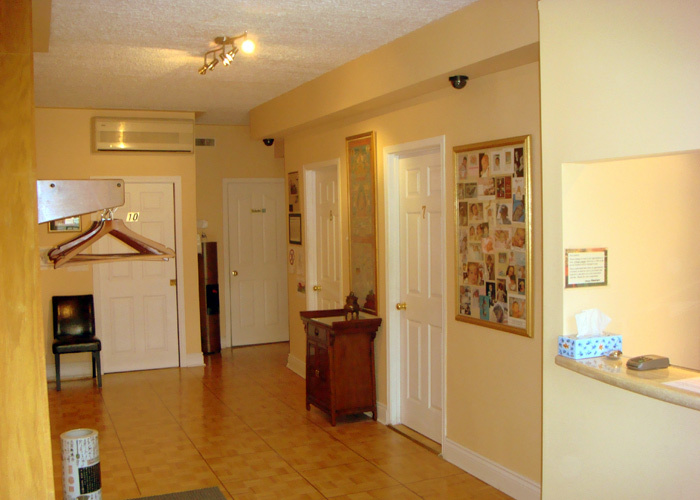 Is the first fertility acupuncture clinic in Quebec. Is open 365 days a year. 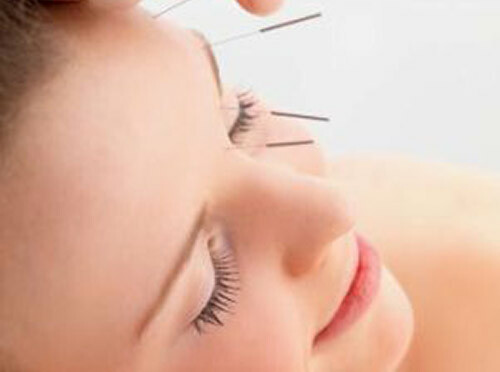 Offers on-site acupuncture in infertility clinics. 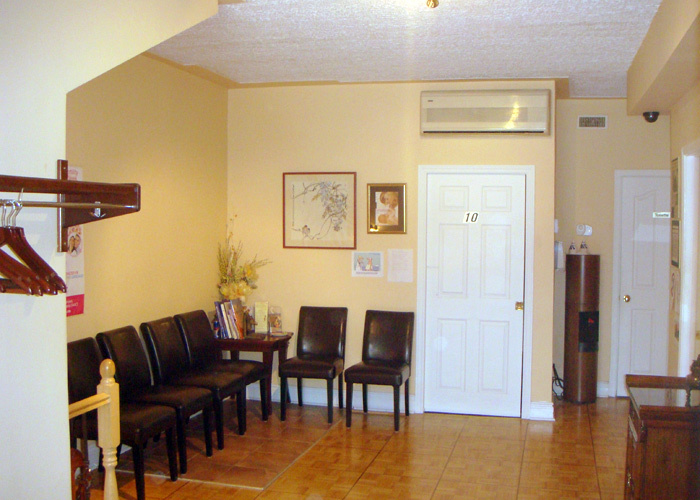 Gynecology and infertility is an incredibly complex and delicate specialty in Traditional Chinese Medicine. It takes years of studying, working under the guidance of a master, and clinical practice to be proficient. In other words, taking a weekend course or reading a few books or clinical studies on the subject doesn’t turn someone into an “expert”. 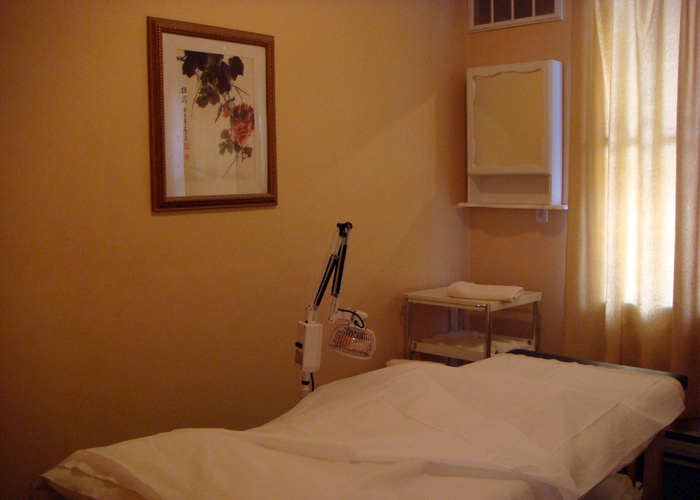 2002 – Incorporated Quebec’s first gynecology- and infertility-focused acupuncture clinic. 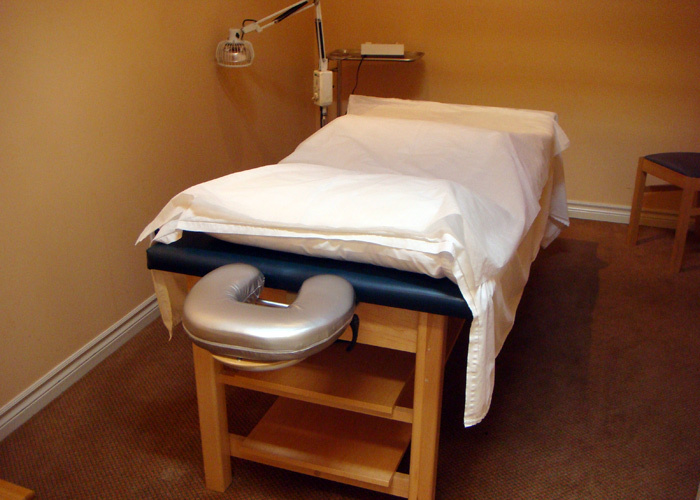 2005 – Started to perform acupuncture at the McGill Reproductive Centre. 2005 – Lectured in the 10th McGill International Symposium on Reproductive Endocrinology & Infertility and Women’s Health. 2010 – Featured on CBC Radio, TVA, Le Journal de Montreal, Hello! Magazine, Luby News (路比周刊), Fortune China (华夏财富), and numerous other news outlets worldwide for Aina’s contribution to Celine Dion’s pregnancy. 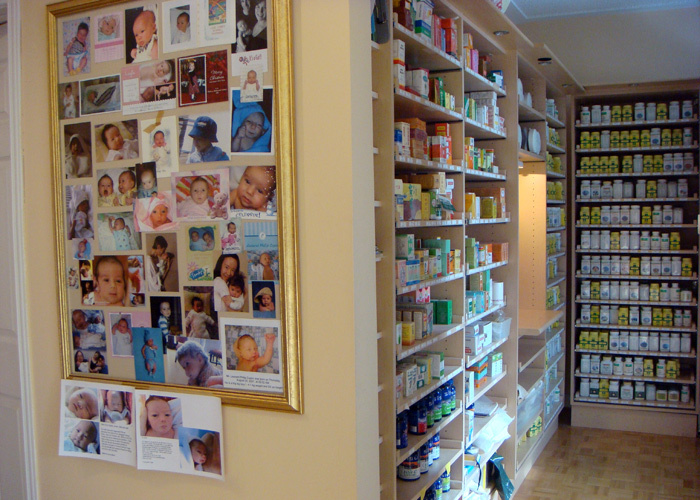 2011 – Taught Quebec’s first infertility acupuncture training program. 2011 – Created the world’s first infertility acupuncture DVD training program. 2011 – Lectured in the Jewish General Hospital on the subject of acupuncture in gynecology and oncology. In May 2010, Celine Dion announced to the world she was pregnant with twins on her 6th IVF + acupuncture. 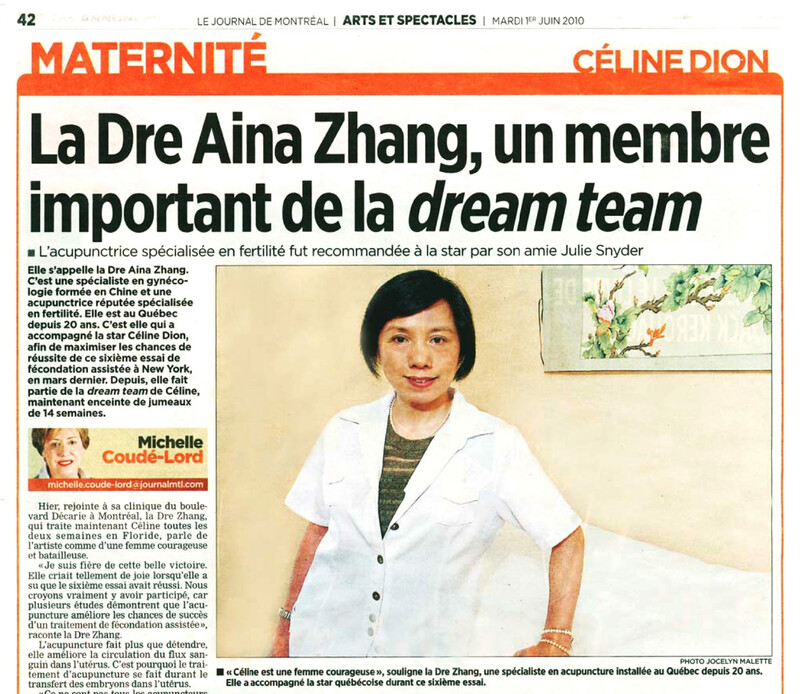 Due to the significant contribution of Aina’s acupuncture to Celine’s pregnancy, countless infertility patients worldwide were encouraged to use acupuncture as an alternative or complementary therapy to IVF and other Western medicine infertility treatments. Traditional Chinese Medicine (TCM) is the oldest continually-practiced literate medicine in the world. The earliest written literature, the Yellow Emperor’s Inner Canon(黄帝内经), dates back 2,500 years (during the Warring States Period from 475-221 BC). Tli book summarized his predecessors’ knowledge and his own clinical experience, and greatly promoted the development of gynecology and Traditional Chinese Medicine. Chinese and Western medicine have very different perspectives and treatment techniques for all illnesses, and they have been proven to have their own strengths and limitations. 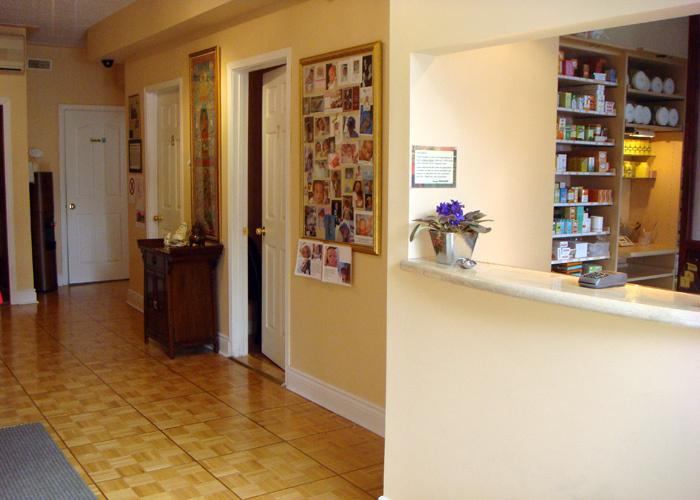 We are firm believers of integrated medicine, where Chinese and Western medicine work together in harmony to provide the best care for our patients. The trend of integration is more and more evident in infertility, oncology, and pain and addiction management. Since Aina has studied both Chinese and Western medicine and subsequently practiced integrated medicine for many years in China as a medical doctor and gynecologist, she is uniquely positioned to help patients benefit from the best of Chinese and Western medicine. 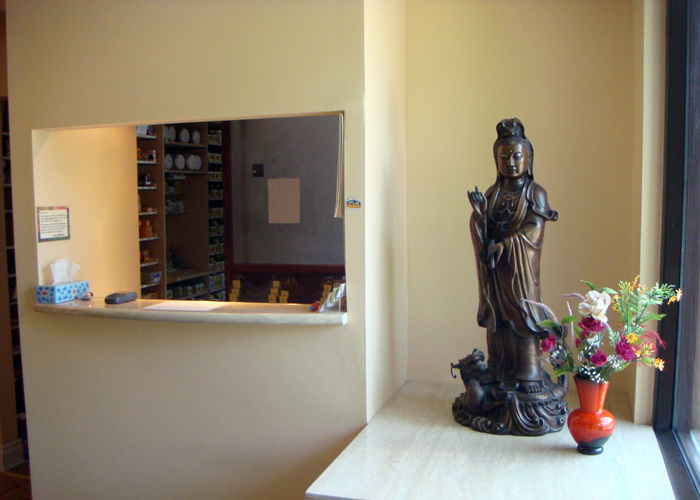 In 1995, after obtaining her license to practice acupuncture in Quebec, Aina immediately started her practice in three different subleased offices in Montreal. 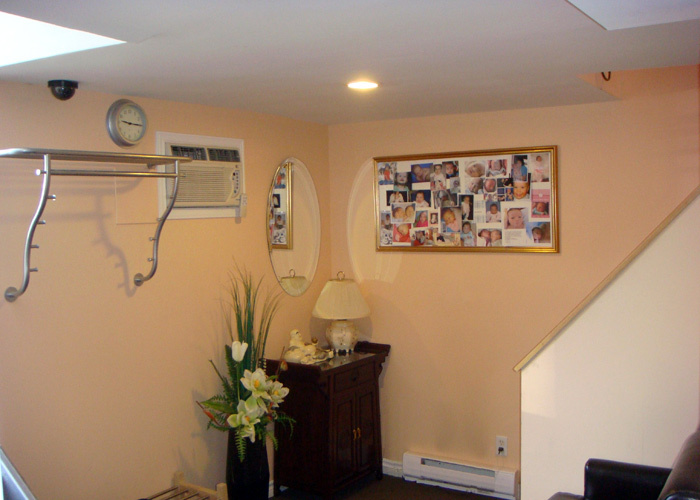 As her practice grew, she consolidated her practice and moved to the current location on 4177 Decarie Blvd, Montreal, in March of 2002. Her clinic was renamed as Clinique Sinocare. In 1977, after a grueling nation-wide examination in China, Aina was admitted into one of the five most prestigious Traditional Chinese Medicine universities in China – Guangzhou University of Traditional Chinese Medicine. On average, less than 1 % of total applicants were admitted into universities in that year, because it was the first year Chinese universities opened to applicants after 10 years of the Great Culture Revolution in China. In comparison, Harvard University accepts about 7% to 10% of applicants in recent years. In the summer of 1982, she graduated from the university and obtained her medical doctor’s degree in both Chinese and Western medicine. During her five years of full-time study in the university, Aina was a “straight-A” student, and that earned her the honor to choose her favorite gynecology department in the hospital to start her career, as the vast majority of jobs were dictated to each university graduate in China at that period. After five years of practicing both Chinese and Western medicine, she went through another round of even more grueling examinations and was admitted to a master’s degree program in gynecology in the Guangzhou University of Traditional Chinese Medicine. Only 1% to 2% of university graduates were admitted to post-graduate programs in China during that period. As always, Aina was again a “straight-A” student among a group of the most elite students. In 1989, Aina received her master’s degree in gynecology. In the summer of 1983, after doing her residency in internal medicine, surgery, gynecology, and pediatric departments for one year, she started to work as a medical doctor in the gynecology department of the Second Affiliated Hospital of Guangzhou University of Traditional Chinese Medicine. 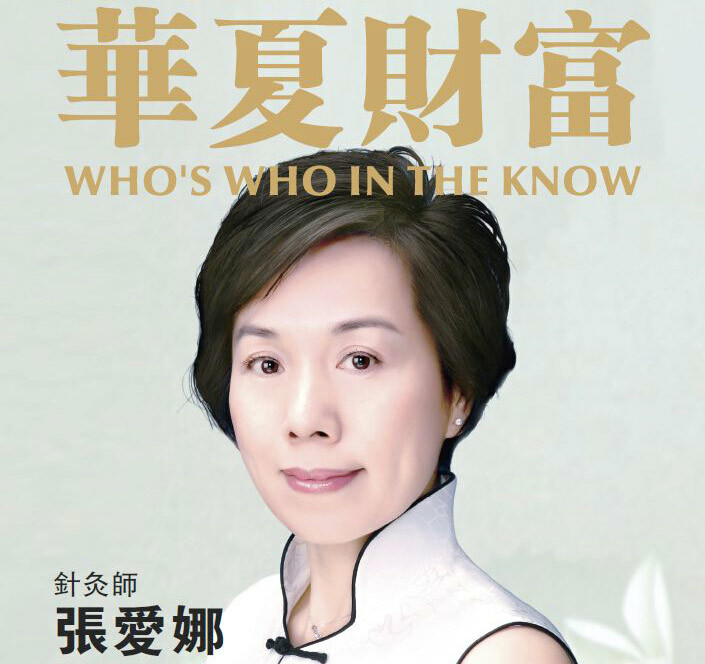 With some luck and exceptional ability, she was chosen to be one of the last two apprentices to one of the most celebrated contemporary TCM gynecology master – Professor Luo Yuan Kai （罗元恺教授). In the following years, under the guidance of professor Luo, she had treated thousands and thousands of gynecology patients with a large variety of illnesses, using acupuncture, Chinese herbal medicine, pharmaceutical drugs, and surgery. 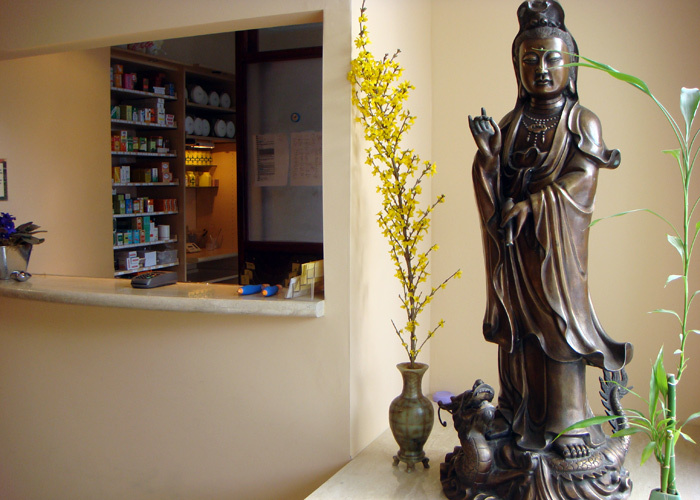 In her daily practice, she often used acupuncture and Chinese herbal medicine to treat her patients, but if needed, she prescribed medication or performed surgery. Due to her outstanding ability to perform complex surgeries, she soon earned the honor to be the “first knife” to perform the largest and most difficult surgery in the gynecology department – hysterectomy. Those were the years that she built a solid foundation for her future career development in Montreal. 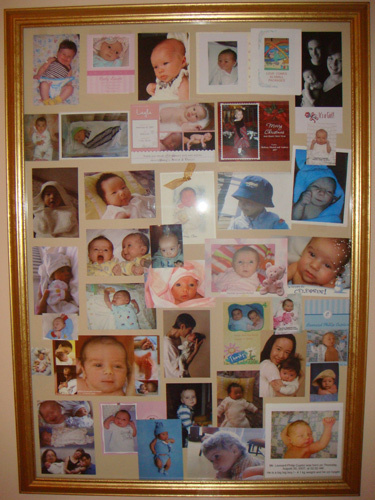 Since 2002, she gradually focused her practice to treat infertility and gynecology patients. Over the years, her professionalism and treatment efficacy have earned the admiration of countless infertility patients and impressed numerous fertility doctors in Quebec. In November 2011, she climbed Jade Mountain（玉山, 4000 m above sea level and the highest peak in Taiwan）in a single day. She and her husband covered 28 km of treacherous mountain road in 11 hours. In July 2012, she completed an 800 km bike journey in Belgium and the Netherlands. In Feb 9th and 10th of 2013, she participated Canadian Ski Marathon and completed 84 km of cross country ski trails in 2 days. English, French, Chinese Mandarin, Shanghainess, Hangzhouness, Cantonese. Welcome to the clinic. 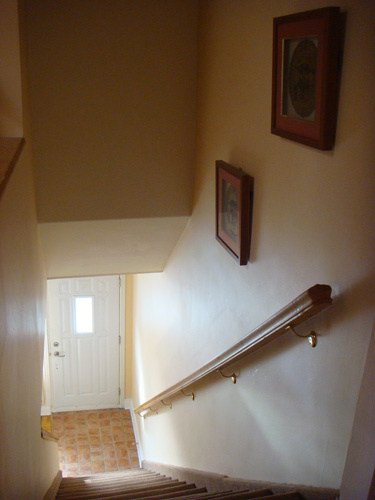 Please clck on each image to enlarge.